Does Banking Sector Development promote economic growth in the country? Banking Sector has been one of the most promising and profit driven financial sector for over a decade in India. During the financial and economic crisis that was felt globally by the superpowers of banking and finance, Indian banking and economy scenario was stable and working just fine. The financial sector in India has registered an overall growth of 15% in the last few years and has shown tremendous performance globally. The Reserve Bank of India could be highly credited for playing such a dynamic role to make this happen. The measures it took on time saved the Indian economy to crash and fall onto its face when the whole world was crunching under global recession. The reforms in the monetary policies and macro-economic policies by the RBI influenced the Indian economy to its core. Growth of the banking system and its reach was also responsible for the overall economic growth in the country. With the ever increasing number of customers getting attached with public sector banks through various schemes and policies, the industry has transformed completely. Inclusion of latest technology in banks and introducing core banking has connected the banks to the entire country in one string. Economic Growth of any country depends upon the growth of income and spending capacity of its population. In a hugely populated country like India, it has always been a tough task to manage and maintain the economic growth by the subsequent governments. There is a wide open market for the financial sector in the country which needs to get tapped by the bodies. This is exactly the scenario with the banking sector at this very hour. Banks have penetrated through the rural and sub-urban areas of the country, joining people from all over the districts and villages to banking. The age old traditions for asking money from Zamindars, Joetdars is slowly becoming a thing of the past as more and more farmers are joining with the banks of the country to avail the benefits that they have been given by the government through various schemes and policies drafted out specially to address their plea. The key to growth of the economic sector is to tap this potential market of rural people and bring them to the iota of banking, which the public sector banks in the country have seemed to do well for the last few years. With the growth in banking sector, there is a consequent growth felt in other sectors as well. The trickle down theory of economics works in this model, the banks being at the top. 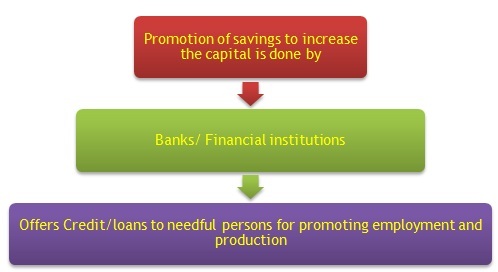 Banks promote saving and increases the capital formation of the country. In return it offers credit and loan for the needy, who are ready to initiate their own ventures and business. It promotes the production and employment of the region in which these banks are lending loans to its people. This production and employments result in income generation and consumption of other products from the market. Consequently that improves the spending and saving power amongst the people, keeping the circle intact and improving the economy of the country. There are new and improved approaches taken by the RBI itself to motivate and incorporate more and more people to the ambit of banking. The inclusion of internet banking, mobile banking, self-help groups and microfinance institutes have become really important indications of the government to include more and more people to the banking sector through digital means throughout the nation. The use of information and Communication Technology (ICT) and its further development would attach people from the rural and sub-urban areas to the banking sector enabling them to take advantage of the schemes and policies launched and run by the government at present. This would in turn help the economy of the country to prosper.